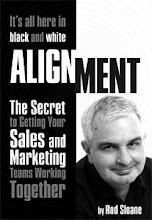 Sales and Marketing Alignment Blog from Rod Sloane: Marketing is Too Important to Be Left to the Marketing Department. You always have to admire someone who is smarter than you and works harder than you. Perhaps I should quit right now. No, come on it's only Monday, gotta keep moving on. One chap I have grown to admire is Jonathan Salem Baskin. Baskin writes a column for advertising age, writes a cracking blog, Dim Bulb, links down there on there right and is an entertaining speaker. But what I really like about Baskin, is the title of his book “Branding Only Works on Cattle” where he attacks all those branding gurus and concludes all that matters is how much you sell and whether clients enjoyed interacting with you. No Marketing hype here. After all the only purpose of your marketing is to make it easier, a lot easier, to make a sale. Forget all the other marketing mumbo-jumbo. And the next time some marketing type talks about branding... sack 'em. Be Different or Be Unique? Come and Hear Me Speak in London on November 6th. How to Respond in Uncertain Times.